← new light switch plates! I finally got some Halloween crafting done. I usually do a lot more, but I’ve made so much already that my Halloween box is very full. So, this year, the focus was on the front door. It seriously needed some snazzing up. 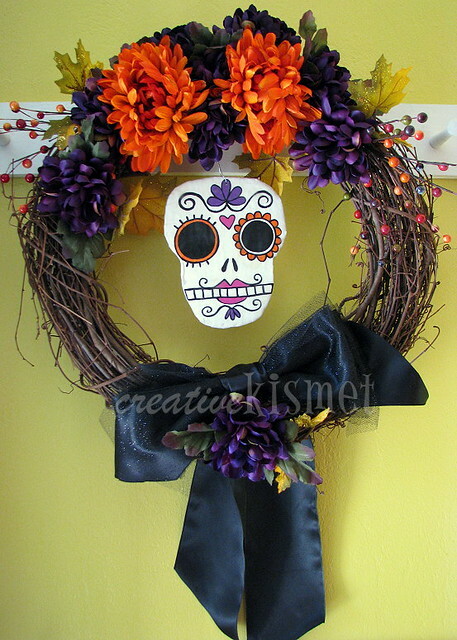 Of course I had to make a Day of the Dead/Halloween wreath. 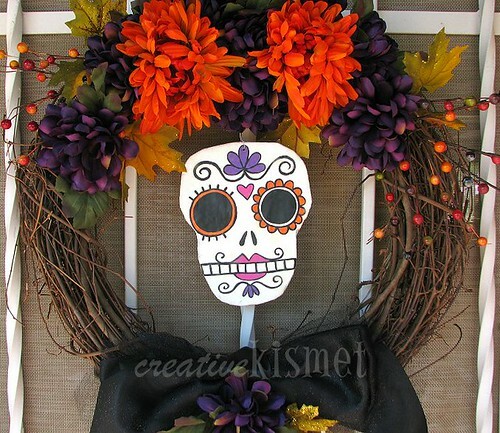 Everything was bought on clearance and the sugar skull was made from cardboard. I decoupaged the skull head shape with bits of newspaper, panted it with acrylic paint and then added a layer of Dorland’s wax medium for protection. From the inside of the house, the way it is hanging, it looks like someone is standing at my door. I’ve startled myself twice! Good grief, so spooky. Now, I need to focus on Halloween costumes!! This entry was posted in Art, Spooky. Bookmark the permalink. 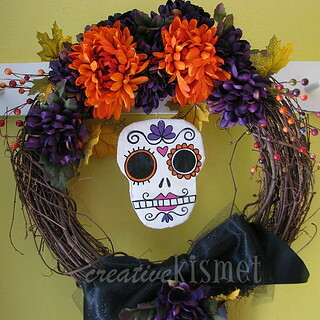 I love the wreath!!! Beautiful! wow- the colours are AMAZING. Love your painting too!